Shoulder and upper limb injuries are a common result of high speed car accidents. One specific painful and debilitating injury is “thoracic outlet syndrome.” This condition is caused by compression on the nerves, arteries, or veins coming from your shoulder and typically manifests through pain in the arms and hands. Sometimes the pain only affects certain spots or even certain fingers. Numbness and weakness in the arms and hands are also typical symptoms. Tingling, coolness of the skin, and discoloration of the skin are also sometimes found. Maginnis Law, PLLC is experienced in representing personal injury clients with thoracic outlet syndrome and understands the tremendous impact it can have on someone’s life. We can help you recover the fair car accident personal injury compensation to which you are entitled. Our car accident attorneys offer free consultations and may be reached at 919.480.8526. If you would rather discuss your claim through email, you may submit inquiries via our contact page. (3) Venous thoracic outlet syndrome (VTOS). Neurogenic thoracic outlet syndrome accounts for the vast majority of TOS cases and is caused by compression of the brachial plexus nerves which lead into your arm. 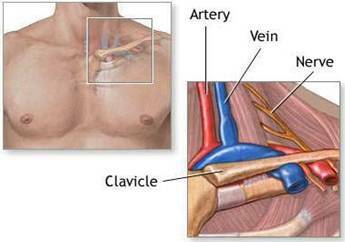 Arterial thoracic outlet syndrome involves compression of the subclavian artery, and venous thoracic outlet syndrome can involve either compression or blockage of the subclavian vein. Thoracic outlet syndrome is typically caused by trauma, such as a car accident, OR a repetitive motion such as typing. As a result, some automobile insurance adjusters refuse to negotiate with unrepresented claimants when the claimant has a job that requires such repetitive activity, even if there were no symptoms before the collision. The car accident attorneys of Maginnis Law, PLLC will fight to recover full compensation for your injuries, including taking your case to trial if necessary. We will work with your doctors to determine whether you are entitled to a “permanent impairment rating.” Such ratings are highly persuasive in establishing to a jury that you will have life-long restrictions worthy of significant compensation. Maginnis Law, PLLC, is a personal injury civil litigation law firm servicing Raleigh, Cary, Durham, Chapel Hill, Apex, Morrisville, Clayton, and Wake Forest. We accept all personal injury cases on a contingency basis. You pay no attorneys’ fees unless you recover damages. We offer free consultations for all car accident personal injury cases. You may contact the Wake County car accident personal injury attorneys of Maginnis Law, PLLC at 919.480.8526. If you would rather contact our automobile accident lawyers by email, you can submit a new case inquiry by visiting our contact page.